Moist and full of flavor. It’s everything you want in a great comfort casserole. 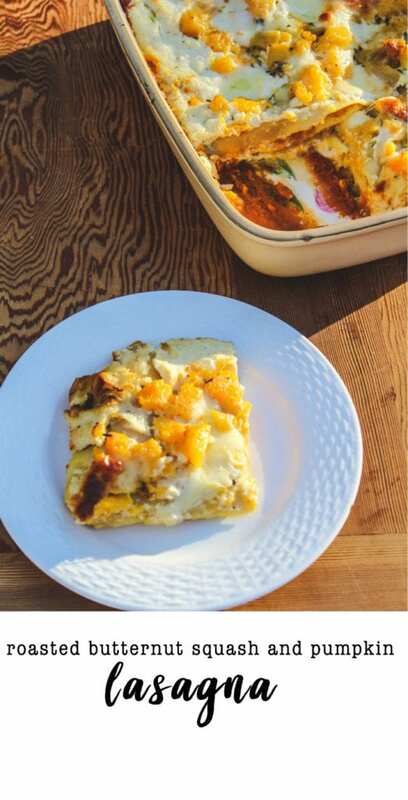 This Roasted Butternut Squash and Pumpkin Lasagna is a fall twist on a classic Italian dish. 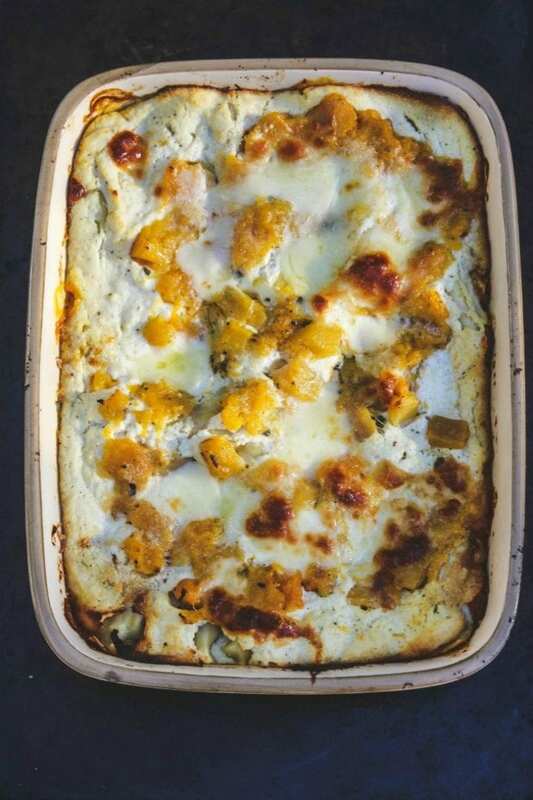 This Butternut Squash Lasagna is the ultimate fall comfort food. 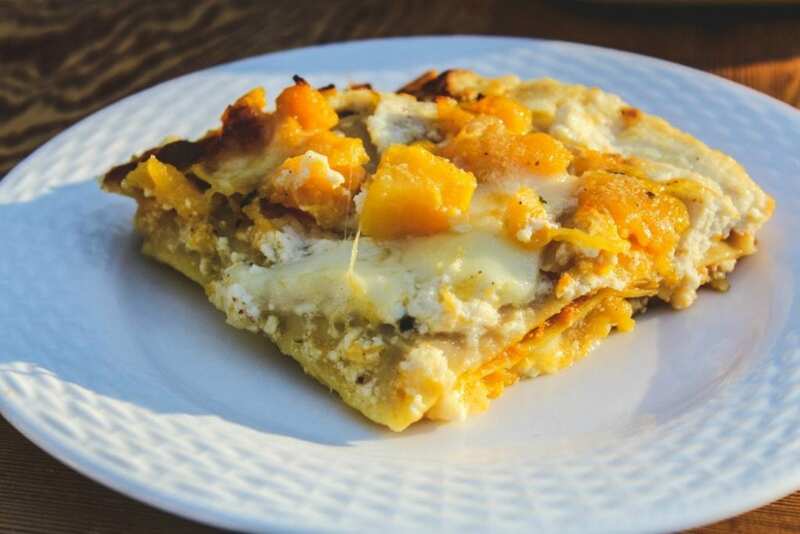 It combines layers of spicy pumpkin puree, creamy ricotta, butternut squash, and gooey mozzarella in a cheesy lasagna that everyone is sure to love. A lasagna that is easy to make put together ahead of time for weeknight meals or for the upcoming holidays! You may be wondering what holiday this fits with. Let me explain about Italian Thanksgivings. Not only do we have the full turkey dinner with all the traditional side dishes, but you will also find an exorbitant amount of Italian touches on this traditional American Thanksgiving holiday. Most years I make a lasagna or some other pasta dish. Perhaps even ravioli or stuffed crespelle (Italian crepes). Depending on which Italian friends we have coming over, there will also be their delicacies from their region in Italy. So everyone ends up going home not only with a little bit of turkey, but also some Italian dishes. 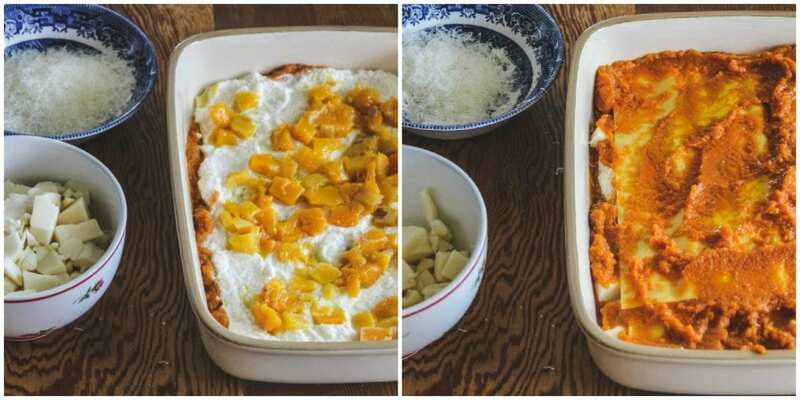 If you have vegetarian friends coming over and you’re not sure what to make them, you should consider this Roasted Butternut Squash and Pumpkin Lasagna. And if you have someone dairy free, like I do, you could buy the vegan cheeses and skip the ricotta filling. I did one small casserole vegan and it was so good. I used Rana’s no boil lasagna noodles that I found at Publix. I normally would make my own pasta, but I wanted to try out these noodles and they are fantastic!! Better than any other ready lasagna noodle I’ve ever tried before! 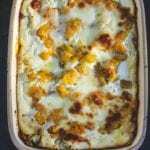 Delicious and tender lasagna noodles cooked in a fall spice pumpkin puree,creamy butternut squash sauce with sage, and Italian cheeses. You could spice the pumpkin puree’ to your liking. You may be wondering about the sweetness from the maple syrup and how it tastes as a pasta dish with all the other flavors. The slightly sweet, the savory, the buttery sage…it’s all makes for a perfect comfort food. You could vary the way you layer the noodles. Just be sure to end with some of the ricotta, mozzarella and grated cheese on top. You could buy butternut squash already cleaned and cut into chunks at most grocery stores. In case you can’t find them, prep your own butternut squash. HOW TO CUT A BUTTERNUT SQUASH? I found a method that the kitchn uses. They recommend roasting the whole squash. Roast for 20 minutes, or just until the flesh softens. 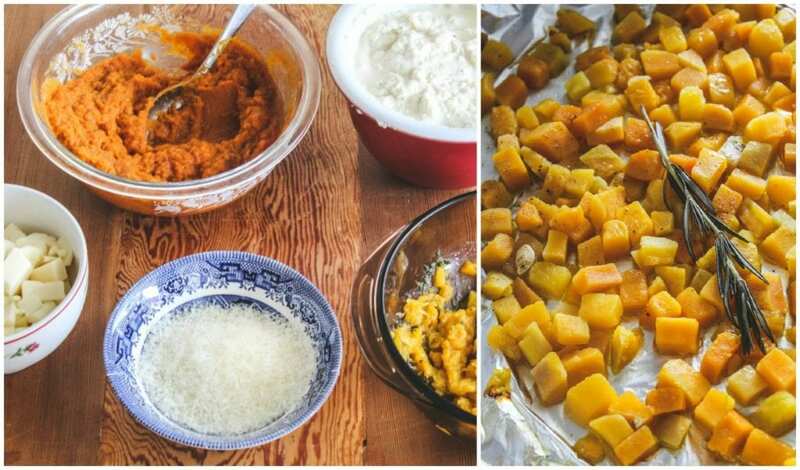 Remove squash from the oven and let it cool a few minutes. Slice the squash into halves and then into the size you need. Place the squash back into the oven for about another 30-40 minutes until it’s ready. A fall twist on a classic Italian dish. 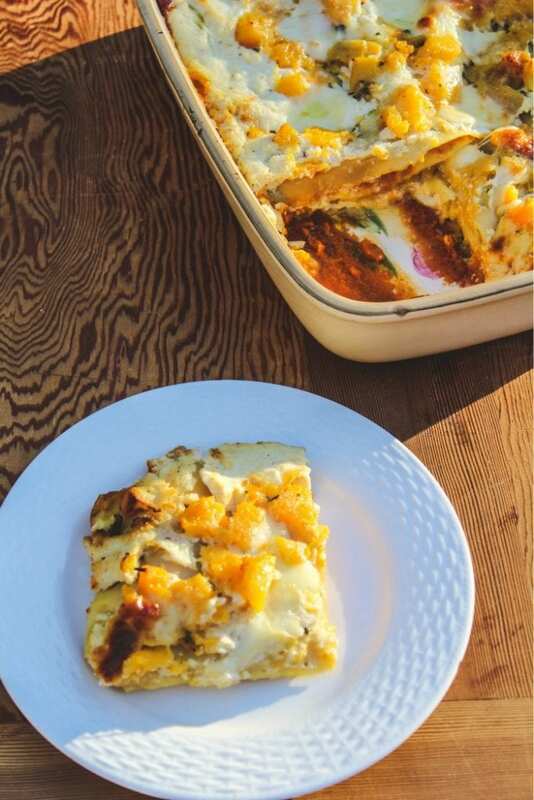 This pumpkin and butternut squash lasagna is a delicious vegetarian dish that everyone will love. Sweet and savory roasted squash and pumpkin puree between delicate layers of lasagna and gooey cheese. Preheat oven to 400 F. Toss squash, oil and 1 teaspoon salt on a baking sheet. season with pepper. Bake until light gold and tender, 25 to 30 minutes. Let cool. Reduce oven temperature to 375F. Combine ricotta, yolks, cream, mozzarella and a pinch of nutmeg in a medium bowl. Season with salt. In a small bowl, mix together the pumpkin, cinnamon nutmeg, maple syrup. Season with salt and pepper (to your taste); set aside. Melt butter in a small saute pan over medium-high heat. As soon as it starts to sizzle, add sage and cook until light gold and slightly crisp at edges, 3 to 4 minutes. Place squash in a medium bowl and mash 1/2 of it (I used a potato smasher, or use a fork) and leave 1/2 in full pieces. Fold in the sage butter and 3/4 cup of the broth. If you feel it needs more broth add a tablespoon more at a time. You don’t want it to be too soupy. Season with salt and pepper. of noodles. Spoon 1/4 of the ricotta mixture over the noodles. Top with a layer of noodles. Top with 1/4 of the butternut squash mixture. Top with 1/3 cup of the pumpkin sauce. Top with a layer of noodles. Top with a layer of the ricotta cheese. Top with a layer of noodles, squash and pumpkin sauce. Spread the last bit of ricotta mixture on top, dotting with mozzarella pieces and grated Parmegiano Reggiano. Cover with foil. Place baking dish on a rimmed baking sheet and bake for about 45 minutes, until the cheese is bubbling and golden. Let stand 15 minutes before serving. What a great fall twist on a classic! I know my family is going to love this! I love this variation! I think this is creative and delicious! Wow this lasagna is incredible! It look so yummy! I want to try it immediately. Wonderful combination of ingredients. I love Fall for this! Such a comforting meal! Yum! This looks amazing! The perfect comforting fall dish! I am loving the fall flavors in this dish! Looks SO delicious!